Mairol crystal flower fertilizer was been specially developed for the blossom time. 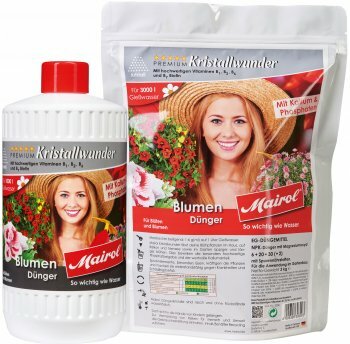 All flowering plants in the house, on the balcony, on the terrace and in the garden will blossom more magnificent, lush and longer through Mairol blossom fertilizer. Decisive for the effectiveness of the flower fertilizer is the increased proportion of high-quality phosphate, which is indispensable in the selected dosage for the willingness to flower, the desired color splendor and the rapid fruiting. The addition of valuable potassium oxide supports the action of the phosphates and gives the plants their strength and resilience. The nitrogen content is reduced because plants need a low-nitrogen fertilizer during flowering and after that. As with all Mairol products, a variety of trace elements, vitamins and phytohormones also round out the recipe of Mairol flower fertilizer. Mairol turbo-active effect: Selected chelated trace elements are immediately available to the plant. Here you find all Mairol fertilizers. Here you add a review for the product Mairol flower fertilizer and share your experience with other customers.